We all love to connect with nature and the best way is to plant few in our homes or gardens. Bringing Mother Nature to home is the best idea to add a little greenery to your home décor. We often have or buy planter like terracotta pots or the clay ones. It comes in usual brown earthy color which is absolute beauty in itself, but why don’t we spice it up and add color and life to it. Here are some of the easiest and stunning DIY ideas for your Terra Cotta Planters which would definitely brighten up the garden or your home. So what are you waiting for? 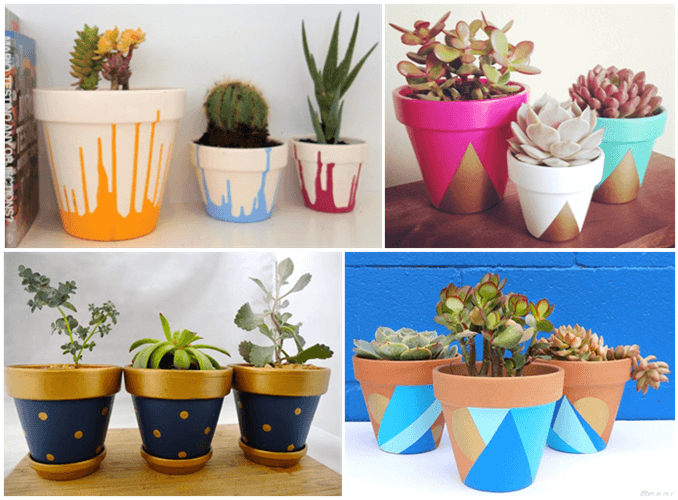 Let’s gear up and bring vibrancy to these clay planters. Aren’t these clay pots looking wonderful? Well they are easy and fun to make too. First paint the terracotta pots with any base color coat and let it dry. Have a container full of warm water, pour few drops of any choice of nail polish color and swirl it with a tooth pick and carefully dip the terracotta pots in the water and keep it out for drying. You will be amazed to see that a marbled patterned have formed on the clay pot. This would add extra pizazz to your garden or home and are sure to many eyes set on them. 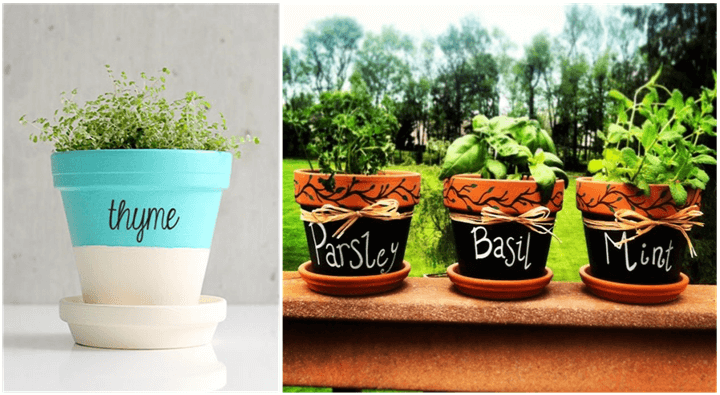 Personalized terracotta pots are a trend these days. They not only bring out a defined look but also is a perfect gift to anybody for their home. Present it to your mother on Mother’s Day or just as a center of attraction in your kitchen garden, balcony or home. Making these are simple. Paint the middle part of the clay pot with a matte black paint. As they get dried you can write on them with a white paint marker couple of times. Done!!! Ur personalized terracotta planter is ready. Or you can just paint the whole terracotta pot and also paint the letters on them. 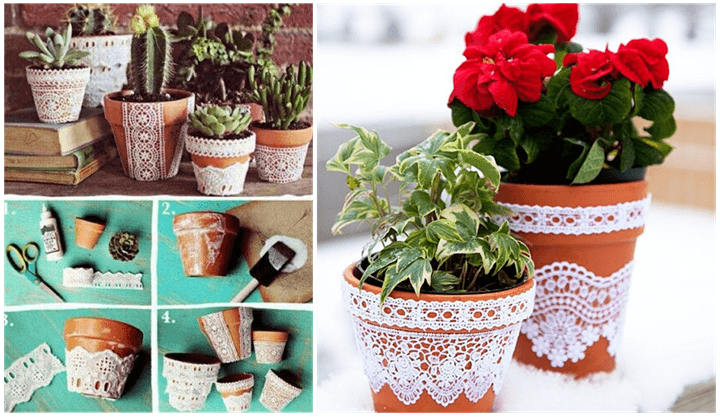 Lace adorned terracotta pots are simple to make. Just cut and glue any beautiful lace piece on the clay pots and Viola!!! They are ready to display. These lace creates a wonderful and elaborate design giving your décor a homely and a vintage look. Decoupage the terracotta pots to give it a funky twist. As explained before in my previous article on DIY Mirrors. Decoupage means to have various cutout pictures, gluing them to any desired object and then coating the pictures with layers of varnish. 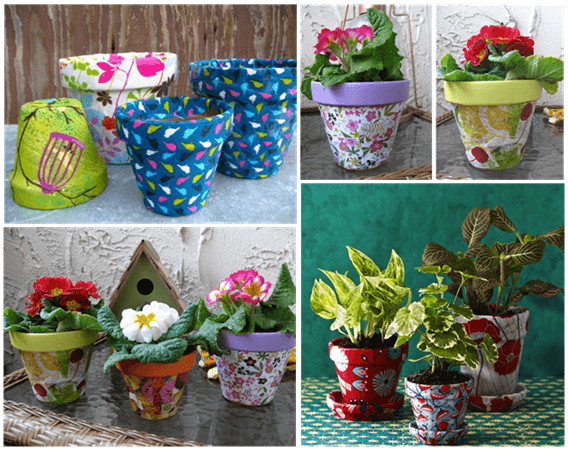 You can use a gift wrap paper, stamp collections, maps or any vibrant fabric to decoupage your clay pots. Now that would be a show stopper for sure. Who would have thought about these rope terracotta planter as a perfect idea to hide our normal terracotta pots? 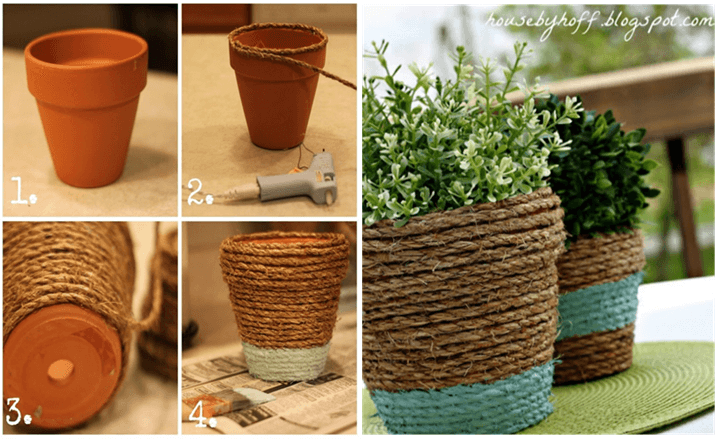 All you need is a glue to stick the ropes around the terracotta pots. Paint it up to give it a classy look and your rope clay planter is ready to make your guests jealous. These clay pots looks as if it were made professionally made. Well the good news is that even you can make these at your home. You could also sell these and make a small fortune. It’s a bit of a tough work but believe me the finished result will awe you. Here you have to take rocky stones or tiles of your choice and color. Apply a dense layer of thin set mortar and layer the tiles or stones of your choice completely in a pattern or any design. Let it dry. Again apply a layer of the grout on top of it and remove the excess with a sponge. Your mosaic clay planter is ready. This takes creativity to a higher notch and adds a wow factor. Jazz up your boring terracotta pots with monogrammed ones. Giving it a personalized touch would be perfect for gifting too. Even kids would love to do this project. It is as easy as that. Color your clay pots of your choice and let it dry. 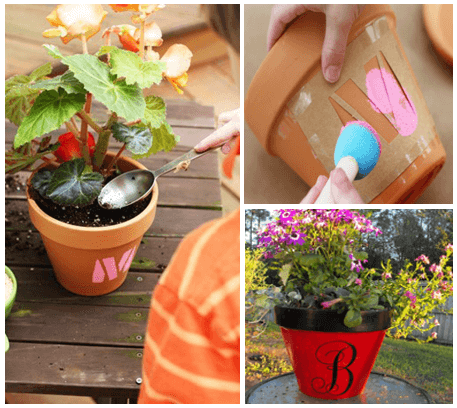 Take a thin cardboard cutout of any letter or words of your choice and stick it around the terracotta pot with a tape, paint it and remove the cutout after some time and a stunning personalized monogrammed terracotta planter is ready to plant. One word that undoubtedly comes to mind on seeing these terracotta planters is “awesome”. Yes, it is awesomeness at its best. Anything in gold these days are a trend, so why not go with the flow and paint the beauties to gold. You can team gold paint with any other color and give it a patterned or geometric design. 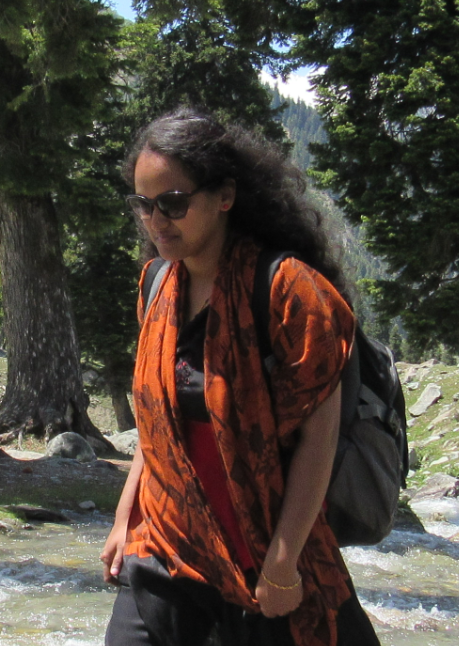 Another idea would take your creativeness to heights because it is even more simple and fun. Add beauty to your outdoor & indoor living area with garden pots. Beautify your terracotta planters with these DIY ideas and learn How to Pep up your Terracotta Pots. 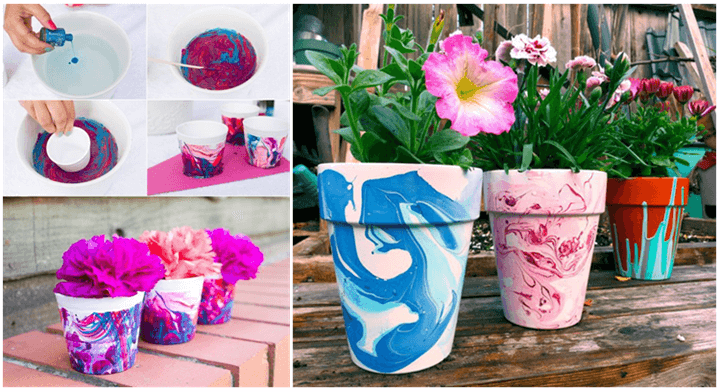 Give your terracotta pots any light base color coat and let it dry and now invert the pots and pour some thick paint of any color and let the gravity do its magic. These are a sure bet to add a modern touch to your décor. Check out our Terracotta Décor for more.. Gardening should be easy and entertaining. These terracotta planters would be sure to make you famous and a talk in the neighborhood. With some creative thinking and artistic magic, you can transform the usual boring plain terracotta clay planters into some beautiful extra ordinary ones. So what are your waiting for? Roll up your sleeves, let the creativity flow, jazz up your home, garden and steal the show.